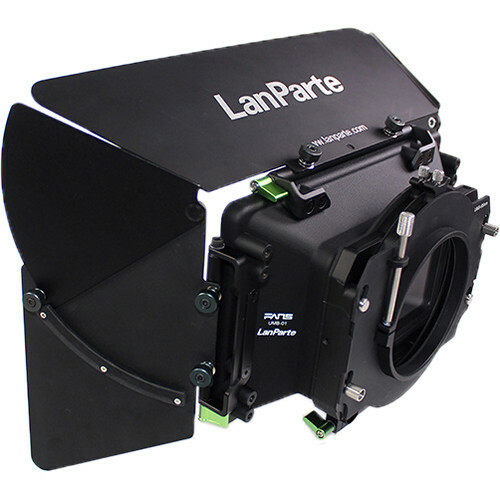 The LanParte UMB-1 Universal Matte Box is a 15mm LWS rod-mount system featuring two filter stages (one fixed/one rotating). It includes one filter holder that supports 4 x 5.65 filters and one rotating filter holder that supports 4 x 4 square filters as well as 109-112mm diameter round filters. The rotating filter holder is adjustable to support different size round filters. The UMB-1 includes a 95mm lens clamp adapter and adjustable top and side flags. Box Dimensions (LxWxH) 14.5 x 7.1 x 6.1"